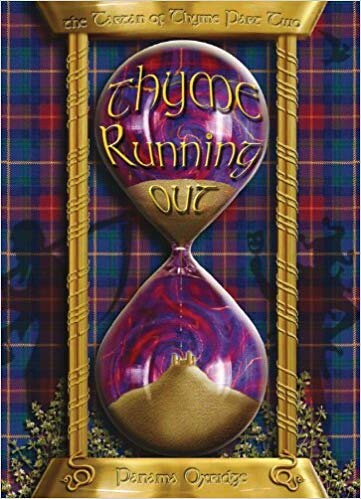 Far too many years after I read Justin Thyme, the first book about the Thyme family, I returned to these rich and slightly odd people in Thyme Running Out. It is just as much fun. And I might know who Panama Oxridge is. There is time travel. Whether this is the cause or the cure of what happens remains a mystery. My brain has serious trouble getting itself round quite so many twists and turns. It almost gives me a haddock, as the cook, Mrs Kof, would say. There are dodos. Obvious, when you can go far back in time. And you can never be certain if any grandfathers are their own nephews, or whatever. I don’t think I’m giving anything away. I didn’t entirely grasp who the bad guy really was. My mind boggled. A. Lot. It’s the kind of time travelling whodunnit where you suspect everyone, including dead people and ones not yet born. At least I think so. Billionnaire Justin is still only 13 and is still having to be the man of the castle. His older sister Robyn helps a bit, but dad Willoughby continues to be feeble, even if he means well. There is an evil new nanny. Every story should have one. And Eliza, the gorilla, is behaving oddly. Who is Agent X? Well, there is no shortage of suspects. And you could feel that with time travel, maybe they are all X. Drumnadrochit is not as quiet a place as you might think. Also, I’m a firm believer in Nessie. There is only one thing… This was meant to be a trilogy, and that being the case, the second book ends in such a way that you want more. Need more. Panama..! This entry was posted in Authors, Books, Crime, Humour, Reading, Review and tagged Panama Oxridge. Bookmark the permalink. Do you review fiction books? My novel, Blessings and Curses, is general fiction, Christian with elements of romance, and mystery.